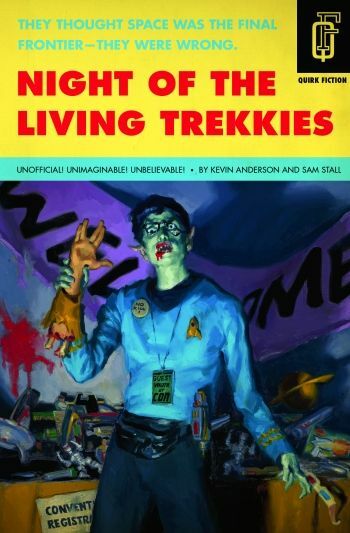 Quirk Books have made a pile lately with fleetingly-amusing splices like Pride And Prejudice And Zombies , but mixing Star Trek and zombies works much better. Extremely enjoyable if you’re a fan of both, this is top-grade pulp nonsense. It centres on former soldier Jim Pike, assistant manager of a Houston hotel hosting a Star Trek convention, as guests and staff start turning into flesh-craving undead. It works because the authors really know their onions – they’re aware that “Janeway hair” becomes a worse insult if you specify “ season one Janeway hair”. They also make some smart observations about the differing ethoses of Trek and zombie movies – and how both differ from workaday reality. Well-structured, with some cunning twists and a neat SF spin on zombies (these ones are the result of alien parasites, and cause people to sprout gruesome third eyes), it’d make a superb film. Sadly, we suspect rights issues mean we’ll never see a Hummer ploughing through a crowd of zombie Borg trombonists (long story...) on the big screen. Shame.